(4) The rise in the birth rate will present the education service with problems affecting principally the supply of teachers, accommodation and furniture. The nature of the solution, particularly for accommodation, will depend in some degree on the extent to which the rise in the birth rate is maintained during the next two or three years. (5) Teachers The Minister already has under consideration the Interim Committee on Teachers the need for training an increased number of women teachers, particularly for work with infants. He would be glad to have an approximate estimate from each Authority of the number of additional teachers, if any, that will be required in September of each of the years 1948 to 1951 solely by reason of the rise in the birth rate. The figures should not cumulative; in other words they should show how many more teachers will be needed in September than in July of the same year. (6) Accomodation The Minister proposes to issue shortly a circular about the educational building programme for 1948. 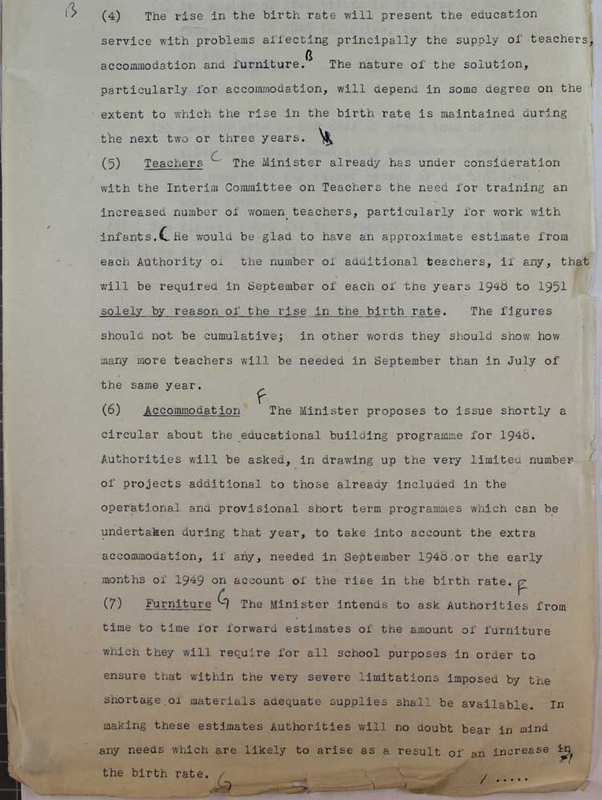 Authorities will be asked, in drawing up the very limited number of projects additional to those already included in the operational and provisional short term programme which can be undertaken during that year, to take into account the extra accommodation if any, needed in September 1948 or the early months of 1949 on account of the rise in birth rate. (7) Furniture The Minister intends to ask Authorities from time to time for forward estimates of the amount of furniture which they will require for all school purposes in order to ensure that within the very severe limitations imposed by the shortage of materials adequate supplies shall be available. In making these estimates Authorities will no doubt bear in mind any needs which are likely to arise as a result of an increase in the birth rate.